I’ve always wondered how many people, after viewing one of those do-it-yourself shows, think “that looks easy! I should be able to do it.” I cringe when they install electrical circuits or components, switches, lights, etc., and say “Don’t forget to turn off the power before attempting this.” This is usually followed by the caveat, “If you are not sure of how to do this, consult a qualified electrician.” I guess that this technically relieves them of any legal responsibility for anyone getting hurt. With human nature being what it is, many homeowners have seen their neighbors installing a light switch, outlet, or replacing a ceiling light without turning off the power. They were told “As long as you do not touch ground, you will be ok, and you will not have to turn off the lights while working.” The problem with this is that you forget where your hands or other parts of your body are, and you manage to complete the circuit. “If you are lucky, all you get is the first part of this blog’s title, Ouch! !” That smarts”. People think “it’s only 110 volts, it will not hurt me.” Unfortunately, 110 volts kill more people than any other voltage level. About 400 people die each year, and another 4,000 people are severely injured by electric shock and electric arc flash. These are only the reported incidents; the unreported amount of electric shock is probably 10 times worse. When was the last time you or someone you knew reported to the Bureau of Labor Statistics (BLS) or to OSHA that you received an electric shock while working on an energized electric circuit or appliance? 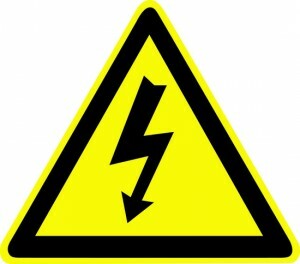 Many people do not realize how little electric current, not voltage; it takes to kill a person. 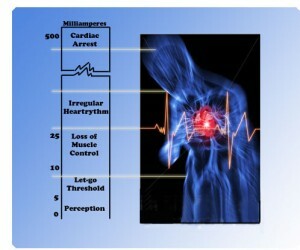 The current it takes to light a 25-watt light bulb, about 100 milliamps or1/10th of an amp, can cause your heart to go into ventricular fibrillation, or the non-rhythmic beating of the heart. Unfortunately, CPR will not work when the heart is in this condition, and an Automatic Electric Defibrillator (AED) will be required to shock the heart back into its normal rhythm. In addition, when electric current passes through the human body, it creates heat and starts to cook the body parts that are in the path of the current. In many cases, you may see a burn mark where the current entered the body and where it exited. You look at it and say “that doesn’t look too bad,” then put some antiseptic on it, cover it with a bandage and go about the day’s routine giving little thought as to what happened, except that it hurt and that you will be a little more careful next time. Unlike getting burned by a flame or hot surface, which may burn the outer layers of the skin, the dermis and epidermis, electric current burns internally and, therefore, the seriousness of the damage may go undetected for several days. Those little burn marks that you received could be getting worse, not better. What is happening is that the cells through which the current has passed may begin dying as a result of the current destroying nerve cells and blood vessels. It has been found that people who have received a severe electric shock, may not show any outward signs of internal damage, and, upon medical examination, have all tests return within the normal range. However, after a few months, the person begins to develop symptoms of internal organ failure. If the current passed through any vital organs, damage may have occurred. It may be only a few cells at first, but over time, adjacent cells begin to fail and eventually the organ itself starts to fail. Electric shock is nothing to joke about; its implications are serious, although in many cases not immediate. For many of us who have received a shock at one or more times in their lives, the difference between reading this blog and having someone reading your memorial is luck. For you, the current did not pass through any vital organs or parts when you received the shock. So the next time you think about working on a live electrical circuit or an appliance that is still plugged in because it is inconvenient to turn off the lights, think about what you just read and call someone who is qualified to assist you in making the repair. If you do not want to think about yourself, think about the effects on your family if you get hurt or, even worse, die.